As the partial shutdown of the federal government nears a month, President Trump, who is also known in the Southern District of New York as Individual 1, increasingly looks like he has no way to get his wall along the U.S. and Mexican border. 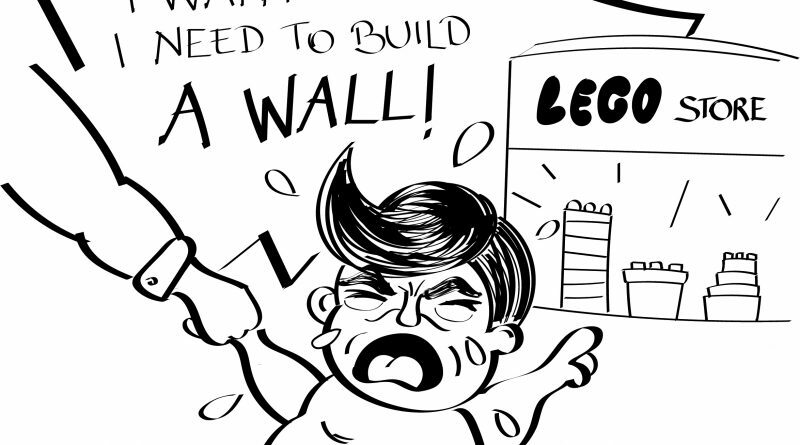 For a man who cares little about policy, building the wall is one of the few things that get Trump animated and get his fanbase riled up. It is Trump’s panacea for illegal immigrants and drugs, even though there is much evidence that the wall would end up an ineffectual waste of money. A month ago, there was a solution—a bill to keep the government working while tabling the debate on the wall. Trump was ready to sign it into effect until Rush Limbaugh and Ann Coulter, conservative political commentators, opened their dumb mouths. Trump is afraid of losing the support of his base, especially since the Mueller report is due soon, so he gave in to the crazy demands to shutdown the government. 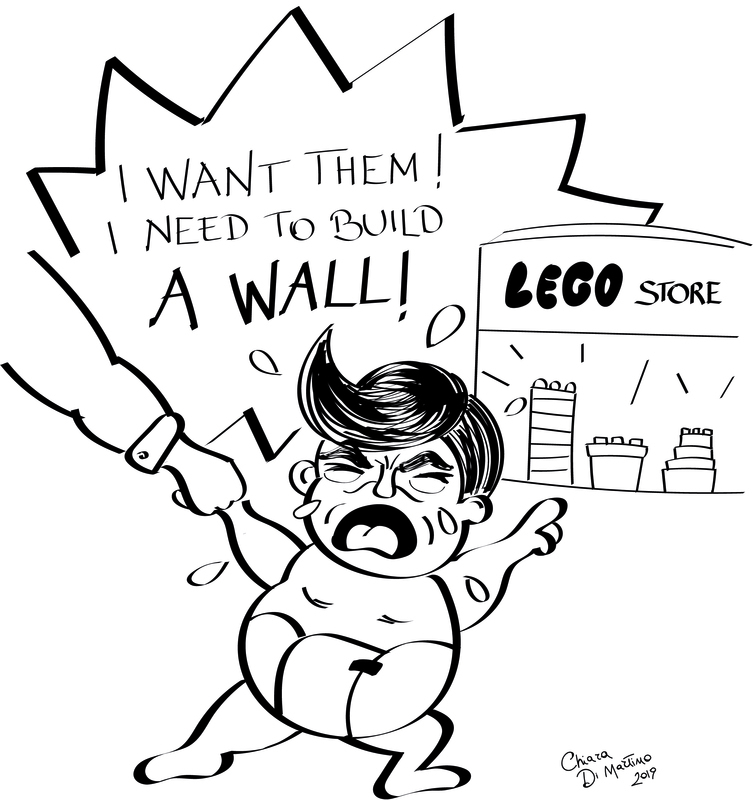 Like a toddler, Trump blew everything up just so he could get the $5.7 billion required to build his stupid wall. In his first month back as Speaker of the House, Nancy Pelosi, the representative for most of San Francisco, is doing a fine job of leading the fight against the wall. Trump is trying to hold 800,000 federal workers hostage, and is showing complete disregard to the financial hardships those workers face. Pelosi and the rest of the Democratic caucus are holding firm, and are telling Trump that they won’t begin any discussions about border security until he reopens the government. Even if that happens, Pelosi said she still won’t allocate the money to build the wall. Every week the shutdown continues, the pain increases exponentially. Economists estimate that every week the economy decreases by .13 percent, and the shutdown is affecting a wide swath of activities. Air travel is slowed down as unpaid TSA workers call out sick, while loans to farmers, food inspections, and many other things are being slowed down or stopped altogether. Trump and his Republican lackeys are trying to lay blame for this whole fiasco on the democrats but that charge won’t stick. Right before the shutdown began, Trump met with Pelosi and Chuck Schumer, the Senate minority leader, and told them that he was “proud” to shut the government down. Trump probably now wishes that he never said that, but thanks to his decision to do the negotiation on TV, the moment was saved for posterity. In 2017, Trump was offered by Schumer $25 billion to build his wall in exchange for the protection of DREAMERS but he turned down the offer, confident he could get a better deal. The man whose name appears as the author of “Art of the Deal” turned down what would have been a good deal for him, and now is throwing a tantrum over one-fifth of that original offer. For a man who promised to bring his “legendary” negotiating skills to the Presidency, Trump sure does seem like a chump. ← Have Your Say: Given the recent death of a Uber passenger, do you still feel safe using Uber/Lyft?